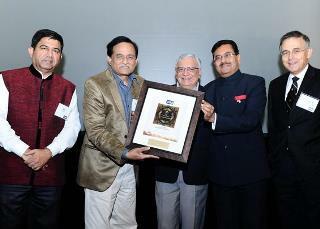 R. K. Sehgal, Former Commissioner GDEcD receives a Friend of UIBS Award from Consul General Ajit Kumar at UIBS 2014. 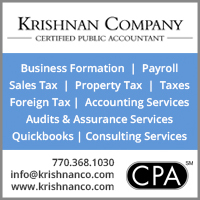 Hosted in Atlanta since 2010, UIBS has emerged as the largest conference in the Southeastern United States (and probably second largest in the country) seeking to promote productive and mutually rewarding business relations between the United States and India. The event’s objective is to grow a sustainable nexus of deepening business relations between the two partners with a view to yield job-creating investment, innovative partnerships, enhanced trade on a common platform, accelerating growth potential in the fast-growth innovative sectors at the intersection of R&D and life sciences. Distinguished and keynote speakers who spoke in UIBS 2014 included Mr. Phil Martens, President and CEO of Novelis Inc.; Honorable Arun Kumar, Director General, the U.S. and Foreign Commercial Service and Assistant Secretary for Global Markets, U.S. Department of Commerce; Honorable Ambassador Ajit Kumar, Consul General of India, Atlanta; and Mr. Gary Black, Commissioner, Georgia Department of Agriculture, State of Georgia. Co-Chairs of UIBS, Dr. John R. McIntyre (Scheller College of Business, Georgia Tech & Chair, Georgia Tech Global Business Forum) and Ani Agnihotri (USIBRC) added one more feather to UIBS’ cap this year by co-hosting the 1st USA-India Forum on Vaccines and Immunotherapy (UIFVI) in partnership with Emory Vaccine Center, The University of Georgia, and the Center for Immunoengineering of Georgia Tech. The Indian life sciences and healthcare industries are experiencing a rapid transformation, characterized by double-digit growth. Biopharmaceutical, medical devices, healthcare providers, research centers are all combining forces to find unique lower-cost efficient solutions to universal problems. Illustrative of this momentum is the September 2014 launching by Sweden of a life science and healthcare platform in India. The Indian healthcare market is currently estimated at US$85 billion. Informational technologies provide the solutions to this fast-changing market supported both by private and public sector initiatives. Rising income levels, a growing elderly population, improving access to health care are all factors driving this growth further enhanced by an increasingly business-aware regulatory environment. Ani Agnihotri with Dr. T.S. 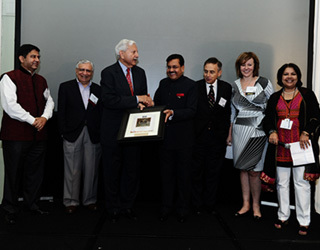 Rao receiving a UIBS award from Dr. Rafi Ahmed, Consul General Ajit Kumar, and John McIntyre. UIFVI sessions alone attracted about 90 top academic researchers, scientists, vaccine policy makers, corporate leaders, and students including Dr. T.S. Rao, Advisor, Department of Biotechnology, Govt. of India; Mr. Michael Cassidy, President and CEO, Georgia Research Alliance; Dr. Rafi Ahmed, Director, Emory Vaccine Center; Dr. Donald Harn, University of Georgia; Dr. Shahid Jameel, CEO, Wellcome Trust, India; Dr. Devinder Gill, CEO, Merck Hilleman Laboratories, India; and Dr. Ravi Bellamkonda, Georgia Institute of Technology to discuss scientific and technological pathways of collaboration between USA and India. Dr. Manoj Kumar Pandey, Minister, Science & Technology, Government U.P., India and Consul General Ajit Kumar with UIBS conference delegates and organizers. India’s story is one of opportunity and continuous growth buttressed by the recent election of Prime Minister Narendra Modi whose policies and newly formed government offer a real path to lift India’s longer term economic trajectory. India’s economy today is still growing faster than most countries and keen investors are taking advantage of the moment: financial markets have responded enthusiastically to the May election. In spite of mixed results associated with a global economic slowdown, U.S. and other multinationals remain sold on India and are deepening and expanding their market penetration. A full range of U.S. firms with advanced products in the technological and commercial sectors targeted by the new government will be entering the Indian market for the first time while other firms are increasingly viewing India as the top anchor platform market for their services and products. India’s demographics are remarkable and the country is on track to grow its workforce by 140 million between 2000 and the predicted date of 2020. This increase is equivalent of the population of the four most populous markets in the European Union. While such figures represented challenges they undeniably represent one of the greatest opportunities in the world economy. Ani Agnihotri, Co-Chair UIBS 2014, and Dr. Rafi Ahmed stand with R. K. Sehgal, Former Commissioner GDEcD as he receives a Friend of UIBS Award from Consul General Ajit Kumar, with UIBS Co-Chair Dr. John R. McIntyre, Yelena Epova of Habif, Arogeti and Wynne, and Sonjui L. Kumar of Kumar, Prabhu, Patel & Banerjee. The right time in India is now while the rules of the game are being redefined and while the Indian markets are taking off with new actors, in a reconfigured global economy. This Summit opened vistas on this ongoing process and the clear opportunities it portends in all the sectors of focus. UIBS gives awards every year to individuals and companies who are championing USA-India business relations or have contributed to grow UIBS. Some of this year award winners were General Mills India Pvt. Ltd.; Dr. T. S. Rao, Department of Biotechnolog, Govt. of India; Lalit Dhingra, NIIT Technologies, Inc.; Mr. R. K. Sehgal, Former Commissioner of Georgia Dept. 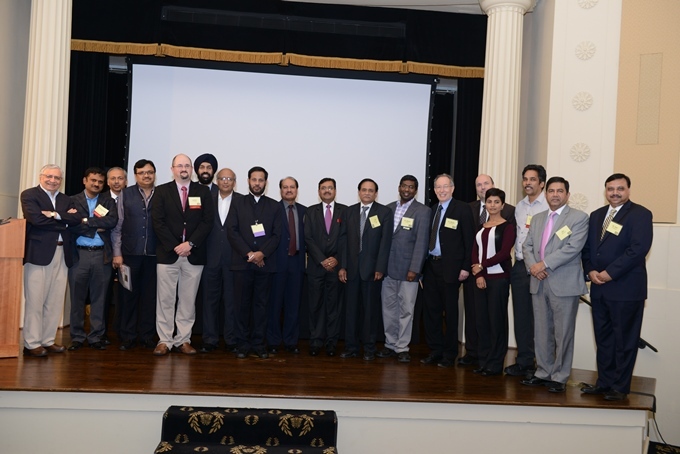 of Economic Development; Dr. Jay Yadav, CardioMEMS, Inc.; and Dr. K. M. Venkat Narayan, Emory University. India’s consul general for the Southeast, Ajit Kumar, delivered the following address opening the USA India Business Summit on September 17. 2. USA & India Business Collaboration / Lalit Dhingra, NIIT Technologies, Inc.	/ Jennifer Irwin / As an enterprise with a deep interest in the success of both nations, NIIT Technologies has set a priority to stimulate skill development, innovation, and sustain job growth. 3. USA & India R&D and Technology Collaboration / Dr. K.M. Venkat Narayan /	Dr. Murali-Krishna Kaja, Emory Univ. /	Launched a new center of excellence aimed at preventing and controlling heart disease and diabetes in India and Pakistan. 6. 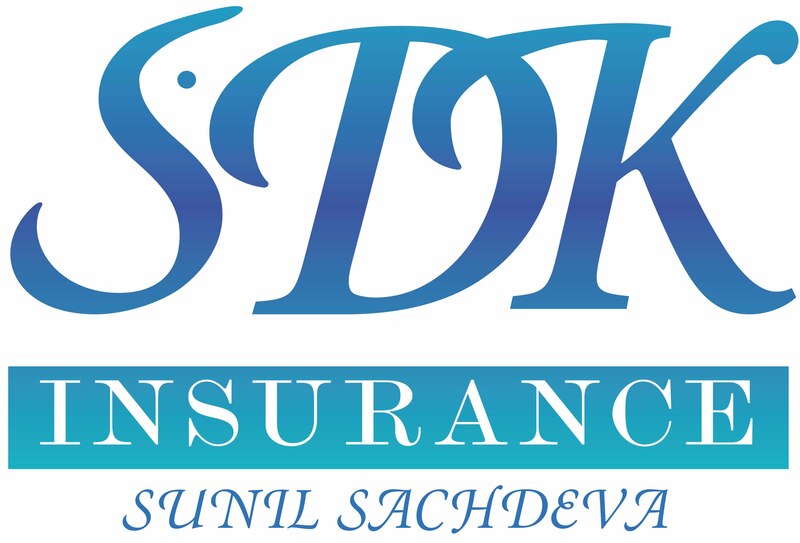 Community Builder / R.K. Sehgal / Dr. Mahindra Srivastava	/ R. K. Sehgal served as Chairman &CEO Executive Officer of H.J. Russell & Company. 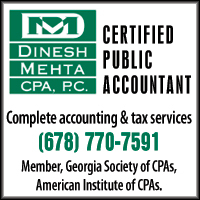 Mr. Sehgal serves as the Chairman of the Board at Georgia Industry and Trade. Previously, He served as Chairman of Williams Group, Inc. He served as a Director of Citizens Trust Bank. 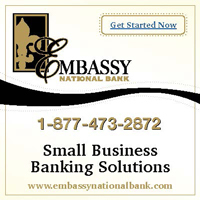 Mr. Sehgal served as a Director of Citizens Bancshares Corp. since 2000.